Windows updates have been a crucial feature to improve, update or fix bugs in Windows PC. however, this does not remain the case always. The recent Windows 10 October updates have been causing havoc for users. 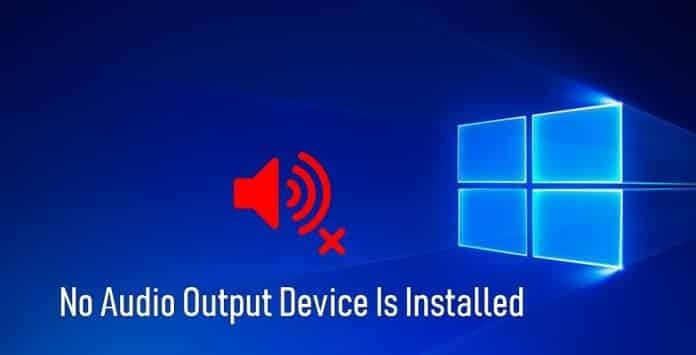 With many reporting “No Audio Output Device Is Installed” error showing in their PC while trying to turn on or increase the volume. You can not even wait for a new update hoping for an automatic fix as it is very crucial if AUDIO is not working on your PC. While there is no official solution to the problem. I kept looking for the solution online and after trying several solutions. I found one perfectly working. A Reddit user “DaveArnold78” has found a solution to ‘No Audio Output Device Is Installed’ that might work for many. In order to fix No Audio Output Drivers Installed error in your Windows 10 PC search for device manager in your windows PC. 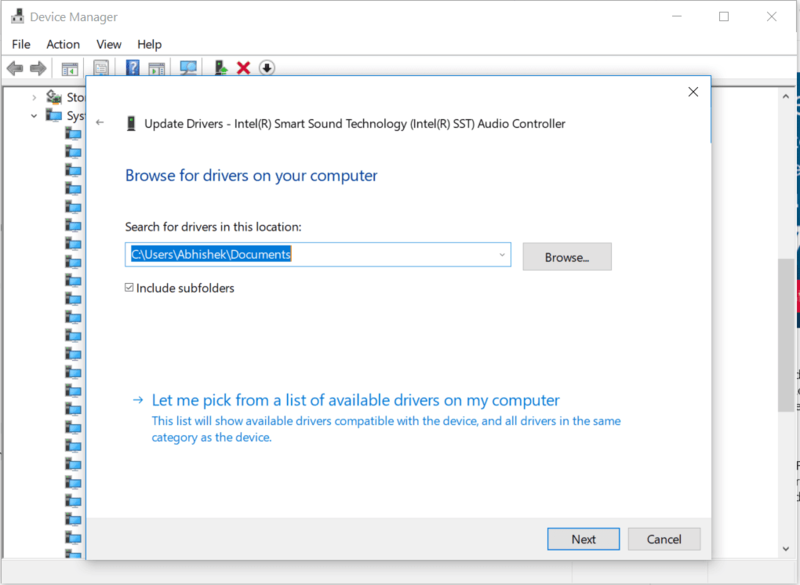 Look for an audio driver that has SST in it. Right click on it and click update driver. In the next screen, you will be asked for how do you want to search for drivers? Select the second option stating Browse my computer for driver software and click next. On the next screen, select let me pick from a list of available drivers on my computer. Select High Definition Audio Controller and click next. You are all done and this should solve the problem. 9. You should get a dialog like below. Click on the Driver tab as shown. 10. If the driver version is 9.21.0.3755, you have the driver that was sent to you incorrectly. 11.Click Uninstall Device. You will get a popup asking if you want to remove the driver too, as shown. 12. Check the checkbox as shown, so the driver will be removed. 14. When the driver is uninstalled, reboot your system. You are all done now! 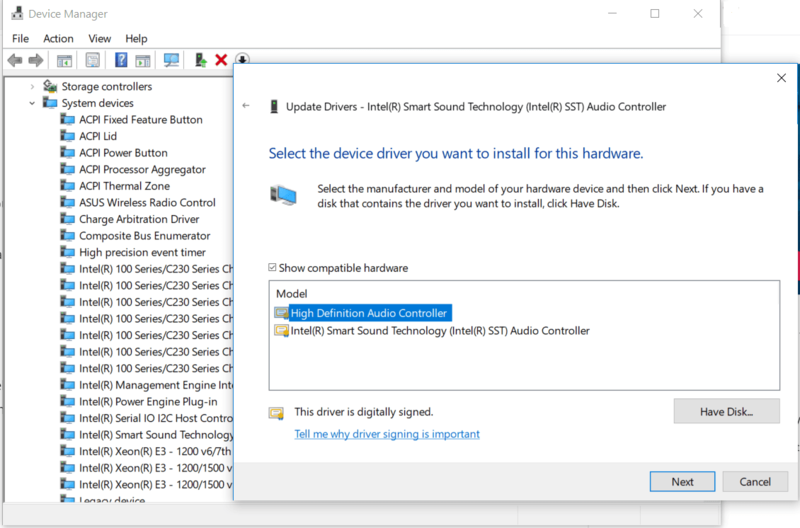 This should solve the error, No Audio Output Device Is Installed on your Windows 10 PC. Users are advised not to try something that they are not aware of. The Internet is full of solutions to every problem. many of which will not work and moreover may create new problems. If you still have any query or any other solution of your own do let us know in the comments below. You are welcome 🙂 do share and help others. I rolled back instead (was already updated it said) and it was instant fix. idk. just point it out. Thank you so much I was working on this for 2 hrs and finally did it, I use laptop too thanks! Thanks a lot Abhisek Kumar Jha, I also faced the same audio sound error. Your suggestions worked like magic. Once again thank you so much for the help. refer to step 4, you don’t need to update it online but look for it in your pc. try it again step by step and let me know if it works. Thank you! This worked, and took less than a minute. Well done. Thank you! Thank you!! worked took 1 min. and I am technicly and spelling challenged…. Thank you!!! Thanks!! Easy fix. Thank you for sharing. Thanks for being on top of this, all the other search results for “no audio output device is installed” were irrelevant. Easiest fix ever, most baffling Windows update bug ever. Especially since I installed the update YESTERDAY and only about 30 minutes ago did Windows suddenly decide that I had no audio device installed. Worked for me! Excellent! A lot of other methods elsewhere don’t work! I want to say something and I want to make myself absolutely clear: you, my estimable human person, are an absolute legend. man thank you very much! this simple fix really is working. i ve tried so many options and this is the only one that work! did not work with me, even after going through the comments. Thank you thank you!!!!!! It works!!! There is no “High Definition Audio Controller” available on my Docs. How do I get it? You don’t have to select it in docs. Go through step 5 again. You need to select- let me pick from a list of available drivers on my computer. It Works! Thank you very much I really appreciate it. I dont know nothing about computers and I DID in less than two minutes, Genial. Thanks a lot Mr Abhishek. Thanks!! I had tried a few other approaches for the “No Audio Output Device Is Installed” message and they did not work. 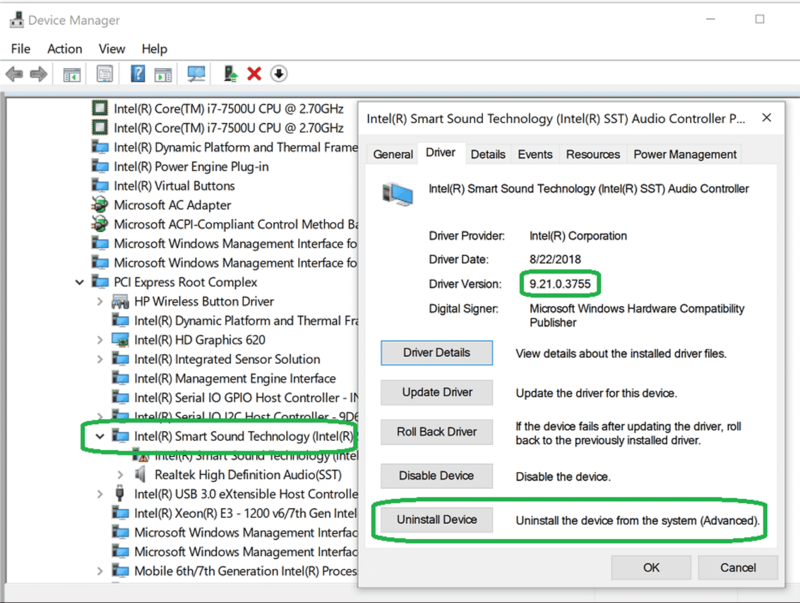 This procedure worked exactly as shown on my October release for Windows 10 PC…I had no audio problems until the October release was installed on my PC. THANK YOU FOR THIS. LIFE SAVER!!!! Thank you very much. It works. I really appreciate it. You are a PRO. It only took me 30 seconds after reading your post. Thanks, much and keep up the good work. YOU ARE A LIFE SAVER!! I’ve tried everything and I’m so glad I found this page. THANK YOU!! Thank you very much, it worked like a charm! It worked! Thank you thank you!!!! I spent 3 hours trying to fix this problem and finally this one worked! YOU SAVED MY LIFE. I’ve been reading for hours and was about to take my computer in for an expensive repair. Thanks dude. THANK YOU THANK YOU THANK YOU!!!!!!!!! after 4 HOURS of trying EVERYTHING I stumbled onto this and it worked!! this website is going into my favorites!! Thank you for clear instructions in helping fix this issue. Truly appreciate it!! YUP None of this worked. I’ve literally tried everything short of throwing the computer out the window. It had audio one minute, and then the next it just stopped. Now I can’t get it back through any method, drivers in computer, online, through Driver Easy, NOTHING works. Im pretty damn pissed off about it too. Someone please help me. In step 6 there is no “High Definition Audio Controller” option for me. What do I do? Yes! This also worked for me. Thanks for the very clear and easy to read instructions. Awesome! Took one whole minute and worked perfectly! Thank you so much! Very very much appreciated after hours of frustration – you helped and made it work ! Thank you. Thank you so much! I spent most of yesterday and two hours this morning looking for a solution – you saved my sanity! ‘The best drivers for your advice are already installed’ this is the message I have after step 5…………so I cannot fix the problem. Any ideas? You need to correctly follow step 4. You will have to select the option 2 in step 4. which is browse my computer for driver software. Try it again and let us know. I believe many others are the same as I am and once again thank you very much! This sort of thing should be selective, having updates just remove an existing piece of software is diabolical, bit like ford changing the way your doors work after youve bought your car! Glad I could help and thanks for the credit OP! It worked. Thank you Thank you Thank you Thank you Thank you so much!!!! You’ve no idea how long I’ve been looking for a solution. this is the best manual as far as i concerned!! omg so easy thank you so so much!!! Perfect! After 7 failures with other websites, this one worked! Thanks guys! Super easy to follow. Love!Love!Love!!! Brilliant! After an hour of wondering what the problem was I found this fix! Thank you so much!!!! I wasted hours searching web for ‘no audio output device’ problem solutions. I this just worked like a miracle!!! It took less than 2 mins. Your step by step instructions were seamless for even a tech challenged old person like me. My sincere gratitude for posting this fix. was about to go technical guy , lucky me found your article first !! bunch of thanks , very helpful and quick way to solve the problem. Awesome! Worked like a charm. Thank you. I tried so many other things today from other sites and forums which all failed. An entire day of working was lost and I was about to give up for the night until finding your page. This fix only took a couple of minutes. I wish I found your information 12 hours ago. Thanks again and I wish you a great day. Thanks so much Abhishek – I have spent a few hours trying to find a solution and your article solved the problem on my Dell XPS 13 in 30 seconds. Well done! You’re a lifesaver, man. Thanks a lot. I have 2 SST Intel audio choices, 1 I can update, the other, that has OED in the description comes back with The device cannot start (code 10)… Under properties it says if failed its initialization call…Help please!! One of it should have the option to roll back driver. try doing it. right click Properties-> select “driver” and then click “roll back driver”. 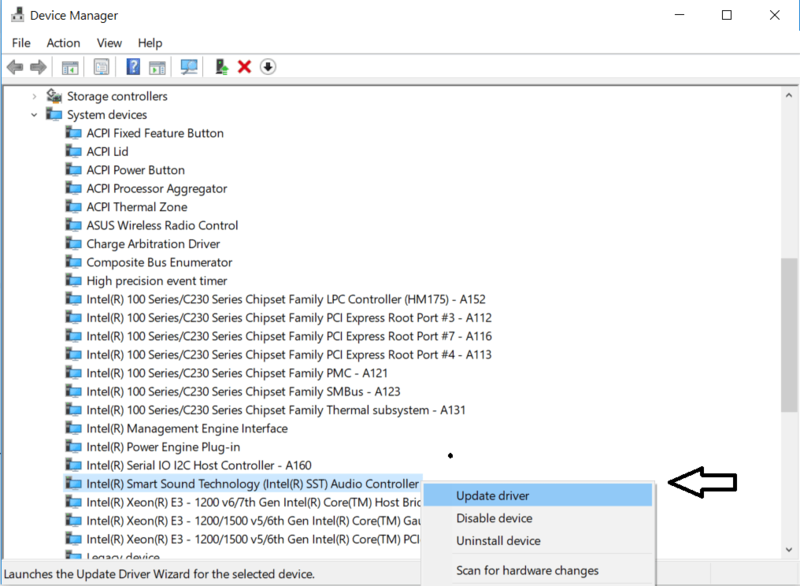 found a fix, on update driver, instead of picking SST OEM driver, I selected High Definition Audio Controller and I have sound again. Thanks !! Thanks for the help. Piece of cake to follow your instructions. Thank you. After 2 1/2 hours of trying to figure this out these instructions took about a minute and fixed the problem. Thank you! Thank you! Thank you!!! Your advise worked, and you made it very simple for us Sr. Citizens. Tks again! Thank you so much. You would think that MS would be able to get a solution out after 2 days of causing havoc…. Not so much. Nothing else that made sense worked. Your solution worked! Thank you soo much !! Saved my day !! Wow dude…you’re a genius. I’ve been trying to solve this issue for the past 24 hours. Thanks a lot. This is a valid solution from you. Thank Bro! It working perfectly! ty!! spent 5 hours yesterday trying stuff that never worked and this fixed it in 2 minutes! appreciate the help! Thank you so much sir! I thought I was going to have to take my Laptop in but this worked perfectly. Much love from Miami. I was going to throw my laptop through a window while screaming, but this worked much better. Thanks for posting it! Please help here, i cant find the STT file on system devices, is there something i can do? device cannot start, code 10 this is maddening! I have tried a lot of methods in the two days and your method is simple and really fix the problem! Thank ypu friend…this fix worked for me….i was thinking to perform a recovery on my system since nothing else worked so far….but this trick did it…thanx again…. Nevermind my previous comment. I choose the one ending in (Audio Controller) and it worked! I’VE BEEN DOING THIS FOR HOURS AND I’M SO RELIEVED. THANK GOD THAT PEOPLE LIKE YOU EXIST. Thank you thank you thank you. I cannot survive without some form of audio access as i dont have a tv just my laptop. Most other solutions didnt work, even the ones on youtube since i couldnt hear what they were saying. But this quick fixed has brought meaning back into my worthless life. F microsoft man if it aint broken dont fix it. Or well if it aint broken dont break it! Ruined my whole night. Thanks a ton, I was really frustrated yesterday trying to find solutions online. Worked for me too. Really easy. I had tried other proposed solutions prior to this with no luck. Thanks! I dont normally leave comments on websites but, from the bottome of my heart, THANK YOU! and God bless! Thank you very much 🙂 i took my issue to IT and they fixed the issue but then it re appeared months later hopefullly this solution sticks ! Thank you so much Abhishek ji. I was struggling with this problem for the past 4 hours. Finally your suggestion has worked. Many many thanks Mr.Abhishek. Thanks for the clear, simple instructions. It worked perfectly on my ASUS laptop. I don’t know whether my laptop has received the infamous October 2018 update, but something bad happened to cause the audio to suddenly stop working. I want to add my confirmation that it worked for me too! Thanks for addressing the problem promptly and with such clarity. It was nice to learn I was not alone! Voir que ça marche!! WOW! Merci. i was so afraid i lost audio forever and this worked!!!!!! thank you!!!!! I tried it and still having the issue- No Audio Output is installed error. Thank you so much! I followed instructions from a few different websites, but nothing worked until I came here. You solved a very frustrating issue in just a few minutes, and I am very grateful!! Thanks!! Thank you so much, thought I was about to have a bad day because of this error, but your instructions took a few seconds to fix the issue. Thank you!!! Excellent fix, and thanks a million. thank you very much! Have been trying to fix this since yesterday. It worked!!L. Thank you thank you thank you!!!!! THANK YOU _()_ Your instructions are so clear and easy to follow. I’ve followed it all the way down to step 5, but apparently I don’t have the ”High definition audio controller”. Has anyone else ran into this problem, and is there any way to fix it? Same here. Still not working for me. you are my god. thank you so much. thank you so much! You were the only one able to help me! Thank you very much. This worked exactly as shown. Big THANKS! This worked great!! I spent about 4 hours troubleshooting this over and over again. Thank you soooo much! I am not tech savvy and this worked like a charm. thank you so much!! this actually worked thank you!!! Thank you so much! Great instructions, easy to follow, and it worked! You totally made my day! I’ve been so frustrated not having sound and how no idea how to fix it. Thanks again! Thank you so much for this fix. I have looked and worked on this all day! You rock! Thank you so much! Worked great! I appreciate you taking the time to figure this out and to share it with us. Thank You So Much. I’ve been trying to fix this since Tuesday 10/9. Your instructions only took 2 minutes. You Rock!!!! I have a new HP Slimline Desktop 270-p013wb. I have no sound. I hover over the sound icon with red x and the message is: “No speakers or headphones are plugged in”. Does this mean that the computer does NOT have a built-in speaker? The HP virtual assistant says that these days many new desktops do NOT come equipped with a speaker. I was on the phone today with HP support for 3 hours and was told over and over that the sound should work once the driver problem(s) is corrected. Whatever they did was not successful. It seems to me I cannot have sound unless I have external device such as speaker or headphone attached. I am a novice. WHAT AM I MISSING!!!! BTW: This solution did not work for me. Can someone tell me what the heck is going on!! the best!! you saved us. presentation tomorrow. Perfect fix. Thank you! Thank you! I couldn’t figure out why my Spotify wasn’t working and then Netflix had no sound. So i knew my problem was larger than I originally thought. I googled my issue and found your post and followed your steps and PROBLEM SOLVED! Easy to follow steps and screen shots. Thank you sooo much. Been fighting this for a few days now. Was worried i might have to RMA my new laptop. Thx Abhishek. Been banging my head trying to fix this for 2 days. You the man! Thank you so much!!!!!!!!!!!!!!!!! Im about to lose my mind!! glad I found this and it worked like a charm!!!! Thank you so much. This was very helpful and informative. thanks! I was trying to solve this from 2 days now and after following your guide it fixed it easily. Abhishek Kumar Jha YOU DA FREAKING MAN!!! THANK YOU SO MUCH!!! YOU ROCK SO HARD ! When my drive finished updating, I could immediately hear the music from the video! Thank you! Awesome! Tried to fix for 2 days following the Microsoft and HP fixes. Took less than a minute using your step by step instructions to fix. You rock! Many, many thanks for being trustworthy and a reliable source. Thank you so much!!! Three days and many, many other “tips” that did not work. This was the fix! I’ve been trying to fix this since 10 am, it’s 8:52 pm and I finally got my audio back. THANK YOU SO MUCH, I have homework due Monday but need my audio to complete it. Once again THANK YOU!!!! I’m desperately figured out how to fix this issue for the last 3 days, and found this article. I jumped to the last part, just directly proceed to your windows update, let it automatically download the latest updates from microsoft and you’re good to go. This is a great fix, but my computer doesn’t even show that there is a driver installed on my Asus. 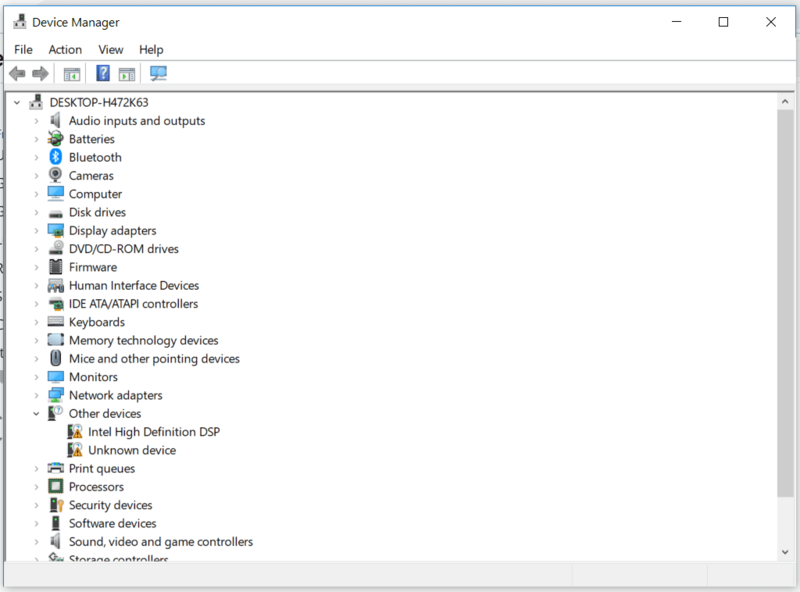 So I downloaded the driver from Asus and did the install, but a driver still does not appear in my device manager. Someone help, please!! Thank you soooo much Sir…………………It really worked…Simple and efficient steps. I tried to follow step 6 but I do not have “Intel SST Audio Controller” listed, what should I do? I have a HP Pavilion x360. Happened to me too. Tried many ways. 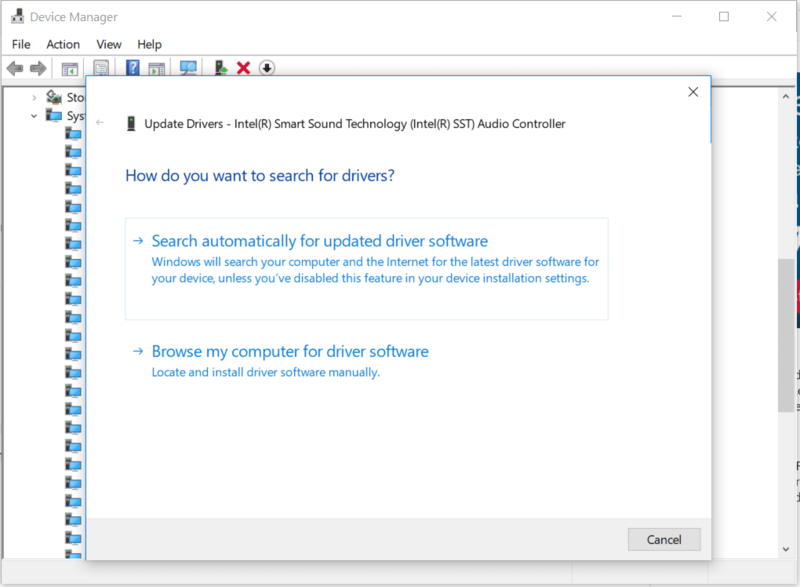 Helped uninstalling driver then instaling “NVIDIA Virrtual Audio Device (Wave Extensible) (WDM). It doesn’t worked either. Then choosed a system drivers to install Realtek(R) Audio fixed issue, but scared me for a while when blue screen appeared saying that changes must be reversed as it case system to stop working. After restart sound is back! 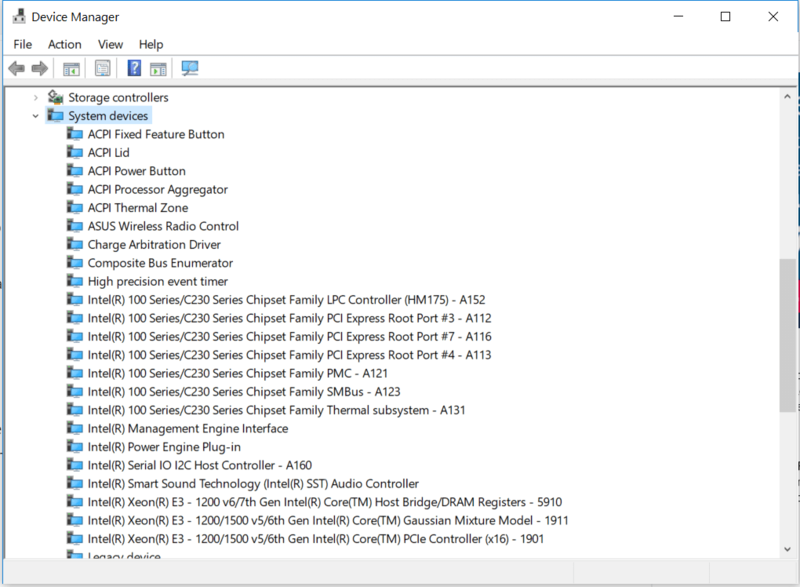 Just download the “Chipset driver” from your manufacturer, install and restart your PC. It works like a charm :)? Hey Bro! 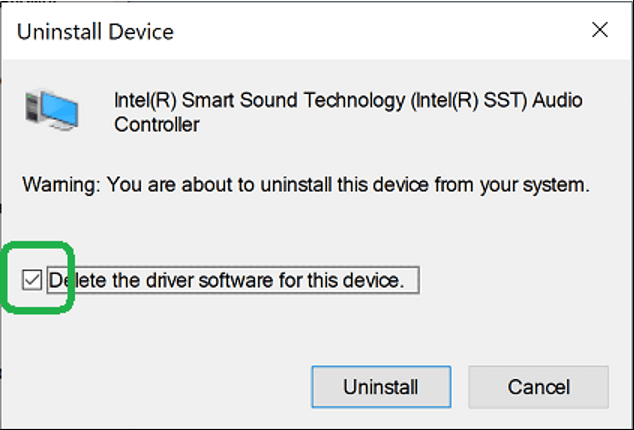 I cannot find the Intel Smart sound technology(SST) Audio Controller in the System Devices Drop-down list.. What shall I do now? Please help me out soon!